At the display are, (from left), students Kris Plunkett (New Orleans), Sara Britsch (River Ridge), Sr. Pat Harvat, O.P. (Vice President of Dominican Catholic Identity at DHS), art teacher Jennifer Frosh, and student Olivia Finger (LaPlace). Among the observances during National Catholic Sisters Week (NCSW), March 8-14, St. Mary’s Dominican High School’s art teacher Jennifer Frosch invited students to contribute to a commemorative bulletin board outside the Campus Ministry office, highlighting various religious orders with photos and brief profiles. Featured orders included the Order of Preachers, Society of Sacred Heart, Daughters of Charity, Sisters of the Holy Family, Daughters of St. Paul, Sisters of Life, and Sisters of Mount Carmel. 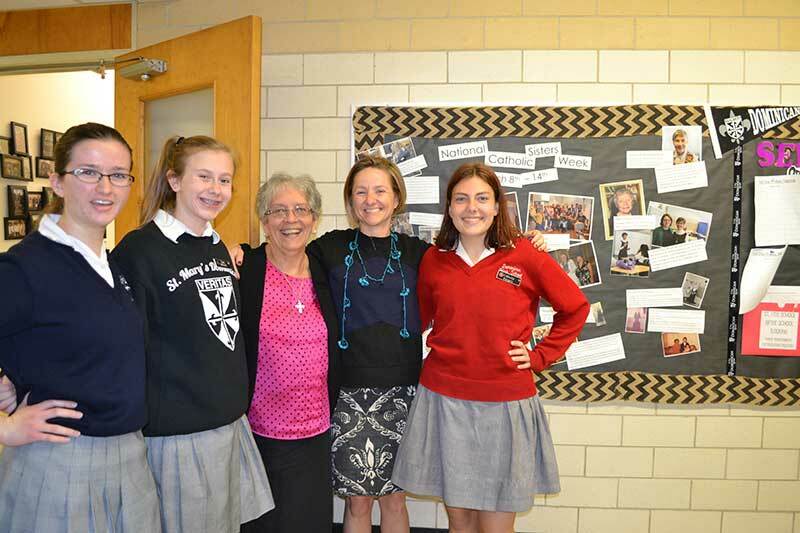 Another display in the Library/Media Center was created by Sr. Angeline Magro, O.P. It featured the eight sisters who are part of the DHS community, and two who recently passed. For the week’s afternoon announcements, the Student Preaches shared their reflections about the community. The sisters also were guests at a DHS Alumnae Board hosted dinner and invited to a lunch hosted by the Student Preachers. NCSW is an annual celebration, created to honor women religious. It is a series of events that instruct, enlighten, and bring greater focus to the lives of these incredible women.